For most of us EBSD users, our day to day experience is with metals, ceramics, or perhaps rocks. For man-made materials, analysis allows us to characterise the microstructure so that we can finetune the processing or fabrication of a material for a specific application. Another common use of EBSD data is for failure analysis where the crystallographic information can be coupled to external characterisation data and deformation structures such as cracks, welds, or ductile deformation features. Figure 1. IPF map of partially recrystallized steel (left); IQ map of quartzite rock from the Pilbara region in Australia (right). For natural materials like rocks, the questions start to get a bit trickier as we typically do not know exactly how a rock has come to exhibit the structures that it has. In combination with other tools, EBSD can then be an invaluable tool to add crystallographic and phase information to the puzzle. This allows researchers to piece together the deformation, temperature, and pressure history of the rock. This way tiny samples can provide insight in processes on a global scale like mountain building and the motion of the continents. A third group of materials that gets a bit less attention in EBSD analysis are biominerals, materials that are formed with a certain degree of biological control to become part of an organism. In these biomaterials, the question is not how we have produced it, or how it could be finetuned to its intended application. Here the question is how biological processes have been able to optimise a material to such a remarkable degree and the EBSD analysis is used to try to understand the biological use and control of crystallisation. Unfortunately, we rarely get to look at structures that are produced by living organisms, except possibly fossils. One of the reasons that “fresh” biomineral structures are rarely studied with EBSD is that they often contain an organic fraction that makes electron microscopy samples susceptible to beam damage. To analyse such materials, the researcher must be very careful. A single pass with the electron beam is often all you get as the structure is easily damaged. In fossilised remains of animals, the organic component has been lost or replaced by solid crystals which make its analysis somewhat easier. For example, in recent years, papers have been published on crystalline lenses in the eyes of long extinct trilobites which were formed of calcite  and EBSD has also been used to estimate which areas of dinosaur eggs are most likely to represent the original microstructure such that the isotope ratios from these grains can be used to estimate the crystallisation temperature of the eggs . A bit closer to us is perhaps the analysis of hydroxyapatite in bones. In the SEM image this cross section of a bone consists of a fibrous framework with brighter areas containing individual hydroxyapatite grains. What is not clear from such an image is if the grain orientations in these areas are all identical or perhaps exhibit random orientation. 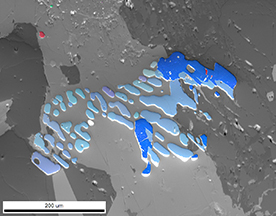 EBSD analysis clearly shows that the apatite grains occur in small clusters with similar IPF colours or equivalent orientations, which indicates that these smaller clusters are connected in the 3rd dimension in the material. Figure 2. BSE image cross-section of bone (left); Hydroxyapatite IPF map on a single hydroxyapatite region in bone (right). The recent introduction of the easy recording of all EBSD patterns during a scan and performing NPAR (neighbour pattern averaging and reindexing) during EBSD post-processing have allowed dramatic improvements in the analysis of beam sensitive materials. You still have to use gentle beam currents and relatively low kV to obtain the EBSD patterns. These patterns are then very noisy and the initial maps often show poor indexing success rates, but once these have been collected you are free to find the optimum way to analyse these patterns for the best possible results. For example, beam sensitive materials like the aragonite in the nacre of shells can be successfully analysed. Figure 3. Calcite-aragonite transition the inside of a shell: original measurement (left); after NPAR reprocessing (right). The aragonite-calcite phase map above on the left shows the initial results of an EBSD map of the inner surface of a shell over a transition zone from the calcite “framework” on the right to the smooth nacre finish on the left of the analysis area. Directly at the interface the EBSD pattern quality is so poor that it is difficult to interpret the microstructure. The phase map on the right is after NPAR reprocessing. Now the poorly indexed zone at the transition is much narrower and the map clearly shows how the aragonite starts growing in between the calcite pillars, then forms a thin veneer on top of the calcite until it gets thick enough to create euhedral planar crystals that form the smooth nacre surface at the inside of the shell. Figure 4. Aragonite structure from pillars to nacre: original measurement (left); after NPAR reprocessing (right). Figure 4 shows another shell structure which is now completely composed of aragonite. In cross section the structure resembles that of the calcite pillars with the nacre platelets on top, but the initial scans do not reveal any structure in the pillars. This could be taken as evidence that the crystal structure might be damaged and cannot be characterised properly using EBSD. However, after NPAR reprocessing the crystal structure of the pillars becomes clear and a feather-like microstructure is revealed. These fascinating biological structures don’t appear often to the average materials scientist or geologist, but if you keep an open mind for unexpected structures you can still be treated to beautiful virtual creatures in or on your samples. For example, dirt is not always just in the way. Here it poses as a micron sized ground squirrel overlooking your analysis. And this magnetite duck is just flying into view over a glassy matrix. Figure 5. Dirt patch in the shape of a ground squirrel (left); crystal orientation map of a magnetite duck flying through glass (right). And what to think of these creatures, a zirconia eagle that is flying over a forest of Al2O3 crystals and this micron sized dinosaur that was lurking in a granite rock from the highlands of Scotland. Perhaps we finally found an ancestor of Nessie? Figure 6. Zirconia EDS Eagle: in zirconia -alumina ceramic (left); on PRIAS bottom image (right). Figure 7. Ilmenite-magnetite dinosaur in a granite rock. It is clear that “biological” EBSD can occur in many shapes and sizes. Sometimes it is literally a zoo in there! Eagle, R. A. et al. Isotopic ordering in eggshells reflects body temperatures and suggests differing thermophysiology in two Cretaceous dinosaurs. Nat. Commun. 6:8296 doi: 10.1038/ncomms9296 (2015). Dr. Ben Britton (@BMatB) asked on Twitter: How were the samples prepared? Dr. Rene de Kloe’s response: The scan of the pure aragonite nacre cross section was collected on a ~10 mu thin sample that was mounted on a (geological) glass thin section. I carefully polished the surface by hand with 0.3 mu alumina as last polishing step on the wheel and finished it off with a 10 minute vibratory polish with colloidal silica. I checked regularly if the polish would not go too fast. The calcite-aragonite sample was a little trickier as it is the natural inner surface of the shell that was quite dirty and in its native state did not produce patterns at all. In this case a small 5×5 mm and ~3 mm thick block of the shell was mounted close to one end of a long glass slide. I glued that slide onto a weight for the vibratory polisher and simply let is swim on the vibratory for only a few minutes. Because the sample was not flat on the polishing cloth, only the very edge was in “hard” contact with the cloth in the bowl. The areas further from the edge only “felt” the longer fibers of the used cloth. This gentle contact in combination with the chemical action of the colloidal silica (which has a high pH that protected the fragile structure from too aggressive etching) was enough to remove the organic residue on the surface and clean it up beautifully. Please note that the patterns still were not great, but quite easily indexable, especially with NPAR™. I have a few more samples like these and will probably try to collect some more maps on these when I can find the time. The data collection was with 15 kV and ~1 nA in 30 Pa low vacuum @ 58 pps and 220 nm steps using our Hikari Super EBSD camera in Tilburg. One important thing is that with these beam conditions the step size had to be larger than 200 nm. At smaller steps the structure simply disintegrated after a few lines. A second pass of the beam on the scanned area showed a clear deterioration of the pattern quality.